All the items are unique and unrepeatable. Colors in the pictures may slightly vary to those of the original. 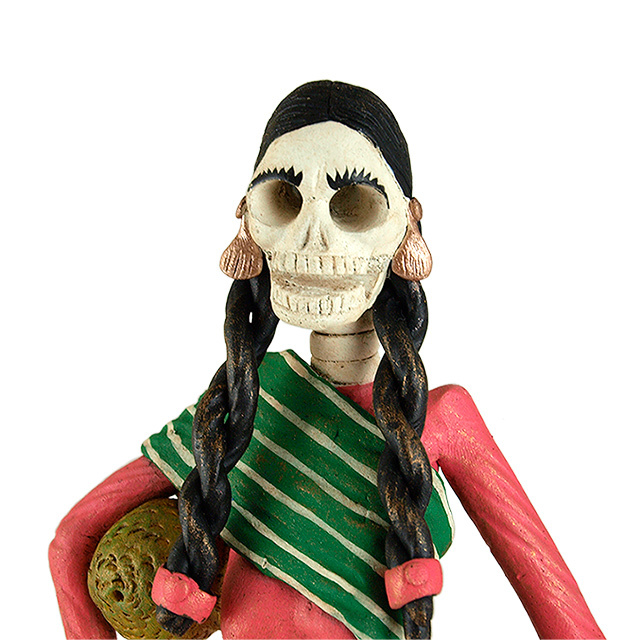 Catrina made in Capula. Its perfect details and material stand out. 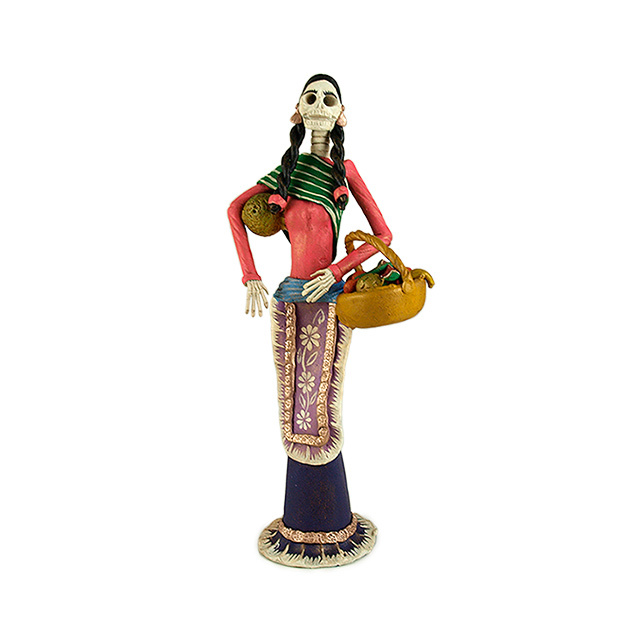 The character dresses a green rebozo and a pink blouse, while the apron alludes to typical aspects of that region. It has a basket of fruits and guaje under its arms. 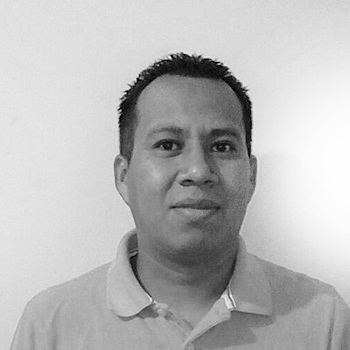 Potter with over 15 years of experience, specialized on the production of clay “catrinas”, iconic pieces made from Capula that represent figuratively and literally the death. His pieces use gum paste techniques and can be decorated with acrylic colors. With care and imagination, Neri Jiménez creates a clay world like no other. 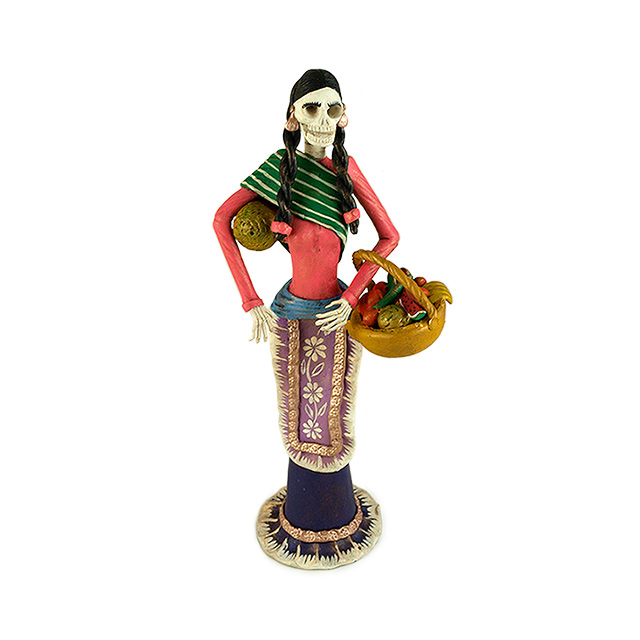 The payments in the Official Craft Shop of Michoacan are processed via PayPal. PayPal is the most common and safe payment method in internet. Over 179 million of people use PayPal to pay safely in millions of websites as ours. If you do not have a PayPal account, you can open one for free at www.paypal.com/mx. PayPal does not share your information with the Instituto del Artesano Michoacano (Michoacan Institute of the Artisan). To pay with PayPal you just need an email and a password. If you do not have PayPal, you can use your Visa, MasterCard or American Express credit card to pay in one exhibition or monthly payments (if they are offered). You can also pay with Bancomer, Banamex, Banorte, Banco Azteca, HSBC, Inbursa and Santander debit card, through link with PayPal. More information about payment methods. In the Official Craft Shop of Michoacan, shipments are sent with FedEx. The shipping is free in all Mexico. Nowadays, the Craft Shop of Michoacan sends items to all parts of the world, according the agreement reached with FedEx. Check with the custom house of your country if there is any tariff restriction with the products you want to acquire. For international shops, the cost of each item depends according the type of product and its physical characteristics (the bigger and heavier it is, the price will be higher). The orders will be delivered by FedEx in the address specified by the customer. International shipping costs are calculated before the payment. Money exchange is an estimate. You should use it just for informative purposes.